Businesses like mine set up shop in tents and booths, and often the only thing that differentiates me from another artist is my work. 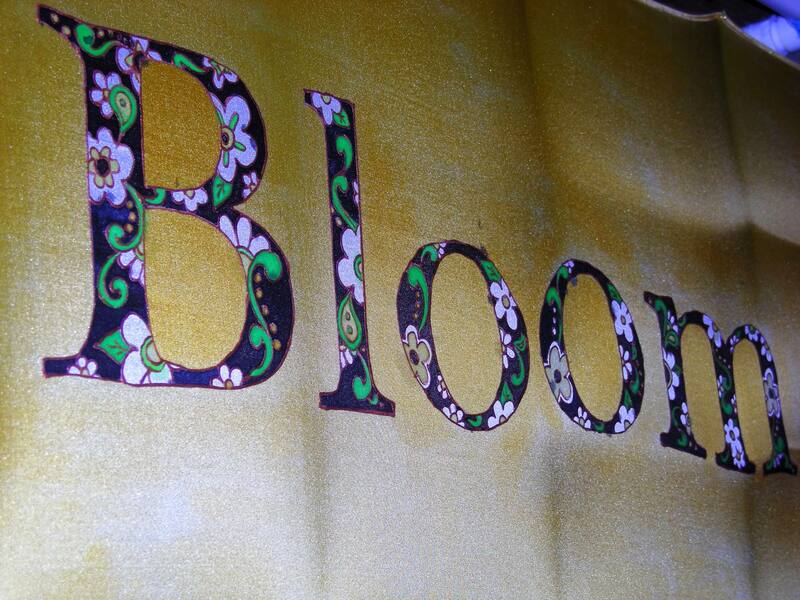 But some of my fellow artists have lovely vinyl printed banners advertising their company name, and web site…. So i initially priced out vinyl banners and decided to hold off because my budget runs very lean right now. Then it hit me… I dye silk for a living, and the average scarf is a perfect 5 foot long by 15 inches tall… a great banner size!!!! as you can see I did the resist work in copper gutta, then began dying the silk. 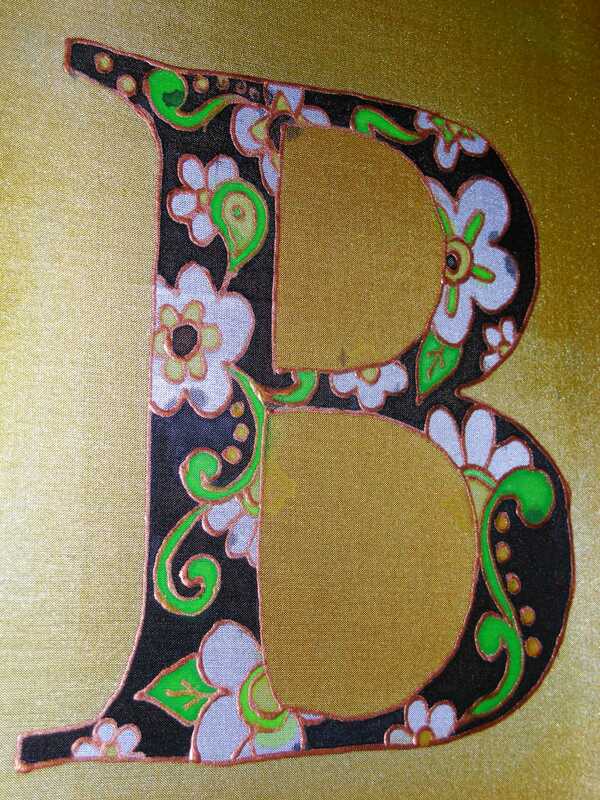 The background of each letter is in a deep chocolate brown black, the leaves and frills in green, the centers in yellow…. and still debating dying the white space of the flowers. The background of the silk is a wash of light apricot. It really looks a bit like antique tea stain linen… unintentional on that. I have to print the website address below… and then process the silk, sew ties to the corners, and we are good to go for Tremont this saturday. Technical Notes: This technique of dying silk is known as the Serti, or French Resist method. The white silk is stretched onto a frame so that it is held tightly. This will enable the dye to evenly absorb into the silk fibers. – I had my hubby make me several frames of pvc pipe… easy enough to add right angle corners, and the frame is about 4 inches larger on each side… giving stretching room. I use strong rubber bands and safety pins to hold the silk to the frame. Next step is to either trace or draw your image onto the silk (in my case, I printed out the text I wanted from my pc as a banner, and taped it to the reverse of the silk….And using the gutta I began drawing the outline of the letters onto the silk. Once all of the gutta is applied it has to be set with heat. I took the scarf from the frame, and ironed it between two crisp linen towels. 5 minutes of ironing on silk setting and the gutta is now permanently fused to the silk, and more importantly it is now water resistant. This is critical for the next step. With my best Sumi Goat Hair brush, and an old shot glass i commendeered and filled with a small amount of dye I began dropping dye in the background of the letters. Black dye looked washed out, so I repeated the process with a Chocolate Brown dye straight from the bottle… and let it dry. I repeated this until all of the small spaces inside the letters was colored…. The next step is to allow the silk to dry, then remove it from the frame, roll it in newspaper and then the bundle of silks in newspaper get wrapped in an old quilt or towel, and placed on the top of my large copper boiling tub- i have a rack that fits into the boiler and elevates the silk above the water. Hot steam the bundle for 1 1/2 hours, then quickly process the silk and iron it… done. I love the process, and best of all, the silk turns out amazingly beautiful. So the steaming and processing is my next step for the banner. And I have another 6 scarves to process with this. Pictures will follow!! !